This Weeks Belli Challenge is to use a LEAF...ANY kind of leaf... I know in my stamp room alone, I have about 4 leaf stamp sets, 3 packages of skeleton leaves (HAD to have those a few years ago and there they sit), Leaf Brads and Leaf paper and probably other leaf treasures! 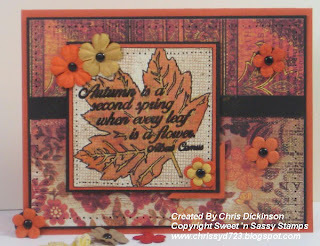 Make a completed project embellishing your work with your LEAVES. Share the link here in the comments linking to my Blog and CBC36. When you post to Splitcoaststampers or to your Blog, be sure and put CBC36 as the KEYWORD and mention of the challenge - with a link! I will do a random drawing for all participants and have a special pack of assorted Designer Papers for the winner! The winner of last week's Challenge was ED check out her beautiful project here. Ed please contact me at adickinson@wi.rr.com and I will mail you your pack of DP. Thank you for participating! I could not decide if I should have the extra leaf or not. I think I like it better WITH. What do you think? Too busy? 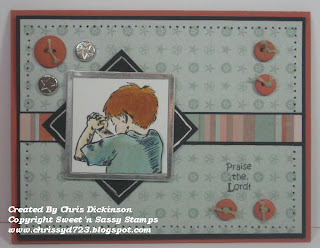 This is also Faith's Sketch Challenge for the Sweet 'n Sassy Stamps Release Party. You can win the stamp sets for each challenge if you participate in them! You can view the challenges here and you have until October 7th at 12 p.m. to post you art work! Thank you for looking and commenting. Be sure to check out the FABULOUS Belli Challenge Design Team's creations!!! Since I am posting early, these will probably be posted Wednesday morning sometime! Ok, you may know that I am a bit fluffy. :) My husband has recently come across some health issues that the doctor said that he would benefit from if he lost weight. So my man is GUNG-HO to lose weight. He of course is dropping the pounds like there is nothing to it. Honestly, I didn't work too hard at it the first week. But did end up with a half of a pound loss. Better than a gain! :) My first goal is to lose 10 pounds. I am starting out small, because I have struggled A LOT the past 2 years in losing weight and if I keep looking at the BIG number, I will get overwhelmed. My friend Carrie is a HUGE inspiration to me and has a GREAT website on healthy living! You would not know it anymore by looking at her now, but she used to struggle with her weight too! I will be checking in periodically with an update about my weight loss. If you want to join me in a little support group for weight loss, I have one started but have not done anything with it in quite some time! Let me know by posting here and we can get it going again. I will give away some BLOG CANDY each time I make a goal! Here is a healthy recipe for this week! Spoon fruit into prepared baking dish and evenly sprinkle oat mixture on top; drizzle with melted butter. Bake until fruit starts to bubble and topping starts to brown, about 45 to 50 minutes. Allow crisp to cool for a minimum of 2 hours. Cut into 9 pieces and serve. Yields 1 piece per serving. Peeling the fruit is optional. Add a 1/2 teaspoon of ground nutmeg and a 1/4 teaspoon of ground ginger for a more robust spice flavor.The longer the crisp is cooled, the more the fruit juices will be absorbed. If the crisp is cut after two hours, the fruit will be a compote-consistency. If the crisp is chilled overnight, it will be much more firm. Try this recipe with other types of fruit: three pounds of pitted, quartered Italian plums make a lovely crisp. Thanks for your support and friendship! Have a great day! Scroll down for the BLOG HOP! Today is the last day of the October Blog Hop! I wasn't feeling well, but decided to come in and do some work/ stamping anyways! :) Sitting on the couch wasn't helping me with my to do list. Here is your Sneak Peek! I used 2 new stamp sets that are coming out tomorrow. You can see both sets in their entirety here. The stamp sets I used are Jesus Is Born and Christmas Pointsettia. 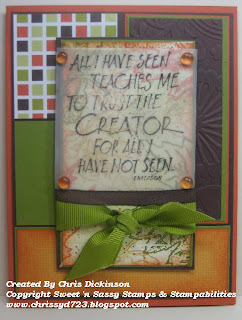 Today is Color Challenge day on Splitcoast Stampers #186! The colors are Really Rust, Baja Breeze, and Chocolate Chip. I stamped my Christmas Pointsettia BOW on white, colored it and punched it out using my half inch circle punch then used my Build A Brads. Love those! 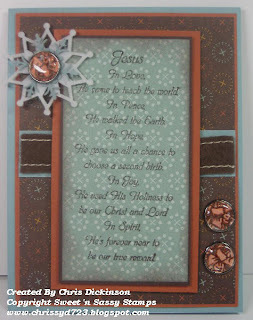 I embossed the words from my Jesus Is Born using Chocolate Chip Craft Ink and Clear Embossing Powder. Then sponged the edges using Chocolate Chip Classic Ink. The Snowflakes are the new SU snowflakes that will be available tomorrow too. If you are wondering, No I am not a Stampin Up! Demonstrator, but some of my friends have generously allowed me to order things that they were not going to get. When you are done here, be sure to HOP on over to Jessica and Korin's Blog and then finally to the Sweet 'n Sassy Blog to see all of the sets and see what Korin has for some FABULOUS Blog Candy!!!! Our Release Party starts tonight at 9pm EST in our forum. I hope you'll join us! Sweet 'n Sassy Stamps blog to see our final sneak peek AND enter for a chance to win the entire October 1st release! I hope to see you this evening! Have a fabulous day! Did you all hear that Sweet 'n Sassy Stamps is having a Design Team Call? Have you ever wanted to be on the Sweet 'n Sassy Stamps DT? Well now's your chance to show Korin your stuff for a chance to join the team! Please read this info carefully as following instructions is going play a large part in our decision making. We are looking for 5 talented stampers to join our team for the first 2009 term, which runs January 1st-June 30th 2009. International stampers are welcome to apply! Send four samples of your best work (100kb or less each) to korinstamps@comcast.netby October 31, 2008. Please use SNSS DT Call as your subject line. You may use any stamps you have although we'd love to see your SNSS work. Be sure to include your full name, address, phone number, email address, any past DT experience (please supply links if possible), any publications you work has been in, and a link to your blog or gallery. PLEASE NOTE: previous DT experience is not necessary. Korin will not be able to respond to each submission. If you are chosen, you will hear from Korin by November 7th and a formal announcement will be made on the SNSS site and blog soon after. If you have any questions please email Korin at korinstamps@comcast.net with SNSS DT Call Question in the subject line. She will do her best to get back to you within a day or two. Hello! Today is another SNEAK PEEK into the Sweet 'n Sassy sets. 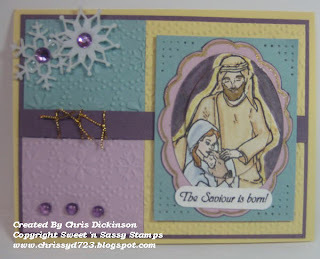 I used the JESUS IS BORN set that will be released October 1 and is one of my designs! When you are done, be sure to go to Faith's blog for another Sneak Peek! Let's see if you can figure out the mistakes! Tell me what the mistakes are and I will put your name in a drawing for an assortment of eyelets! I will hold the drawing on Tuesday, September 30 and announce it Tuesday evening at the RELEASE PARTY and on my blog along with my list of mistakes! :) Your hint is I can see 5 mistakes on this card while picking it apart in my minds eye. A few things about this card... These colors are WAY out of my "normal" colro choices. I think I may have used Perfect Plum only once or twice in the past year. 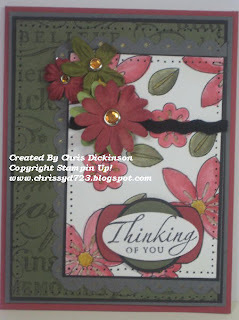 The other thing about this card is I used Courtney's Tuesday Challenge for my card. Whew! I used a lot of stuff. LOL Now to clean it up. I think that is the worst part. Don't you? Thank you for stopping by! Be sure to HOP on over to Faith's blog today for another SNEAK PEEK! Have a great week! 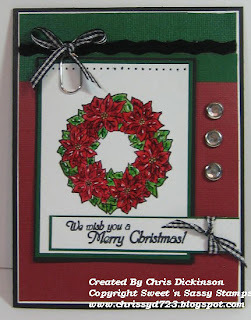 Todays Sneak Peek is titled Holiday Greetings and that is exactly what it is! A set filled with wonderful ONE WORD sentiments! 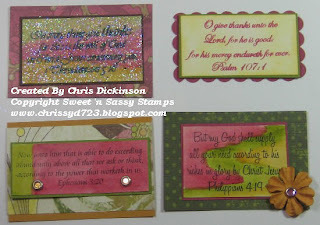 I used a few of these sentiments that are featured in different fonts and lined them up on an acrylic block. I put just enough space between them to do a quick little doodle. I used some of my favorite colors - because today is also my Sisterhood of Blogging Stampers group had the challenge of making something using our FAVORITE THINGS. Purple is "ONE" of my favorite colors - BLING is another FAVORITE thing of mine and I absolutely LOVE this stamp set and the different fonts. I will get A LOT of use out of it! Be sure to HOP on over to 9/28 : Kathy & Christi's Blogs! Thanks for looking! There will be another post shortly, so scroll down! WELCOME to the BLOG HOP! Today, when you are done looking here - be sure to check out Michelle and Laurie's Blog for more Sneak Peeks! Monday will be here and Faith and Tuesday 09/30 will be Jessica & Korin, Sweet 'n Sassy Blog for some SWEET blog candy! I know this lay out is not the most original, but can I use the excuse of I feel sleepy today? LOL I really wanted to keep this card simple because I I felt the image in the scallops from Nestibilities (my new toys!) were a little busy. While my girlfriend Debbie was here this morning she mentioned the Swiss Dots folder for the Cuttlebug, so I decided to use that as my background when I sat down to finish this card. Do not forget to HOP on over to the other blogs listed above! And scroll down for other information! Have a fabulous day! My dear daughter, Ariel (isn't she a cutie?) had a L' Bri Skin Care Party last night. We had such a great time last night. Please let me know if you do this, so I can let Jennifer know - and then Ariel can get the credit. THANK YOU so much! Have a fabulous day! BLOGGERS CHALLENGE - WARHOL TECHNIQUE & BLOG HOP! This week's BLOGGERS CHALLENGE is to use the WARHOL TECHNIQUE and it is also the beginning of BLOG HOP for Sweet 'n Sassy Stamps. I have 2 more stamp sets being released on October 1. So be sur eto join us for the BLOG HOP and then the RELEASE PARTY on September 30. Check back here often so you can see more sneak peeks into the new sets that will be released! My inspiration to the Warhol Challenge is right here. Personally, I am not sure how I feel about this challenge - but I did it anyways! LOL I think the card I made is cute. Okay - back to the coloring. I do not have a lot of Copics - so I mix a lot of my own colors. That is why I love the Copics is you can BLEND! I use the greay scale markers to add depth in color. You can mix the colors right on a pallette. But truth be known, sometimes I do not like doing the extra step so I just color over and using my Colorless Blender to mix the colors on the paper. To blend the colors, it works best to have a Matte Kote Finish type paper or your colors will not blend well. I had these red embellishments laying around. I do not remember why I bought them, but I thought they would add a nice touch. I added a bit of glitter on the Owl's Christmas hat too. So what do you think? Two more things - be sure to check out the BLOGGER CHALLENGES on the side bar to the RIGHT. Everyone does such great work and it is fun to see how all of the different artists personal take on the challenges! Also, check here often for more SNEAK PEEKS the next few days. The BLOG HOP starts today at Korin and Sandy's Blog. There is more information on the side bar on the top of my blog for the next several days! Have a fabulous weekend! Thank you for stopping by! This Weeks Belli Challenge is to use your METAL EDGE TAGS and if you do not have any of those TRY the FAUX METAL technique. You can embellish anything or stamp on anything with your Metal Edge Tags or FAUX METAL. I used mine here as our focal point. Here is what you need to do...Make a completed project embellishing your work with your METAL EDGE TAGS OR FAUX METAL project. Share the link here in the comments linking to my Blog and CBC35. When you post to Splitcoaststampers or to your Blog, be sure and put CBC35 as the KEYWORD and mention of the challenge - with a link! I will do a random drawing for all participants and have a special pack of assorted Designer Papers for the winner! The winner of last week's Challenge was SUSAN HACKNEY check out her beautiful project here. Susan, please contact me at adickinson@wi.rr.com and I will mail you your pack of DP. Thank you for participating! Thank you for looking and commenting. Be sure to check out the FABULOUS Belli Challenge Design Team's creations!!! Please keep our friend Courtney in your prayers. She is home now and assessing damage to her home from Hurricane Ike. Be sure to check out what everyone else has made and make a comment too for them please! We all LOVE comments. It is fun to see what everyone is thinking about what we are creating! :)Thank you for stopping by. Be on the look out for this week's upcoming BLOG HOP! First of all...HOW in the world did it get to be September 23 already? I think it was just September 1!!! WOW! Time is flying. that was to use BAJA BREEZE, KIWI KISS and VANILLA. Then I also did my friend from Sisterhood of the Blogging Sisters group, ANNA BANANA's Sketch challenge #11. 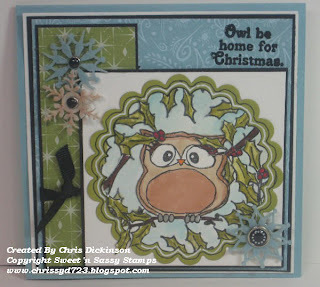 I think this Owl from Sweet 'n Sassy Stamps is sooo cute and Korin designed a FABULOUS Christmas Accessories stamp set for it. This will be released next week at the Release Party on September 30. Oh yes I almost forgot! I used my new Nestibilities dies on this to cut the scalloped circles. I am LOVING these new toys! I used my Aquapainter on this leaves and background for the Kiwi Kiss and Baja Blue then colored and shaded the remaining images with my Copics. Thanks so much for stopping by! I will be posting the BLOG CANDY WINNER later today! Have a great day! Have you had weeks where you just did not feel like stamping? I truly haven't had many, but after the past several weeks of INTENSE stress, I have just felt the need to just BE. I tried stamping but instead went up to bed and took a nap... Saturday and Sunday too. If it were not for Homeschooling my children and having company for dinner this evening, I would have taken a nap today too. I am just TIRED! I will post a card tomorrow! Do not forget, next week I have TWO more sets being released on October 1! I have posted a few sneak peeks and will do more this week. 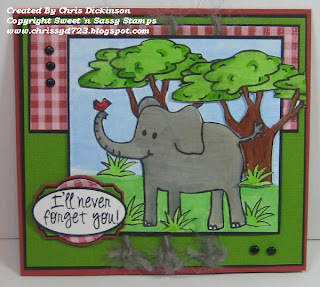 There will be a BLOG HOP that starts THIS WEEK at www.sweetnsassystamps.blogspot.com. Be sure to check it out. Another reminder! DO NOT FORGET that tomorrow is the deadline for the BLOG CANDY! THANK YOU for visiting and scroll down to have a chance to win my personal design AUTUMN BLESSINGS! 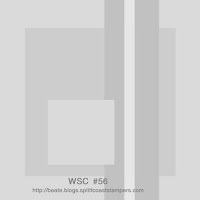 Yesterday was Beate's Weekend Sketch Challenge - WSC #58 and I just recieved a box of goodies from a friend and it included some new things from SU that will be available in October! I love this GORGEOUS image from SU and colored it in with my Copics. With Beate's sketch, I was not sure what to use for embellishments but just recieved some of the ADORABLE Felt Snowflakes and thought they needed a bit jazzing up with the Build a Brads. So what do ya think of my card? Thank you so much for looking! Have a fabulous weekend! Scroll down for Blog Candy! 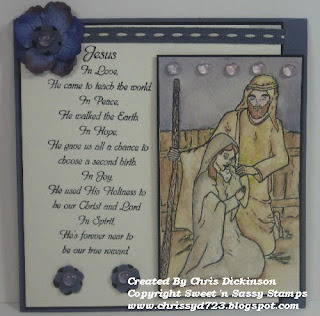 This is Blogger Challenge Day and I am including another NEW design from my soon to be released stamp set "JESUS is Born." This stamp set will be released on OCTOBER 1. You can see more at the BLOG HOP next week! I will have TWO more stamp sets released on October 1. Now one thing to note - this set will not include the fence...as I was watercoloring, I decided to draw that in there. The straw/ hay is not part of the set either...I drew that in as I was watercoloring it. This weeks Bloggers Challenge was to WATERCOLOR. I absolutely LOVE to watercolor, so this was not much of a challenge for me. :) I grabbed my well loved Aquapainter and Watercolor Wonder Crayons and my Vintage Violet (retired SU) and colored while I chatted on the telephone. Mary's garment was colored with Going Gray, Basic Gray, and Close to Cocoa -Joseph's garment was colored with Creamy Caramel, Close to Cocoa, Going Gray and Sahara Sand. 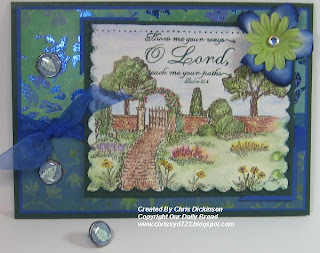 Be sure to check out the other Bloggers Challenges Watercolored cards! I always love seeing their fabulous work! I've been tagged by Christina one of my sisters from my SBS24 group! 1. I have a NEW job of designing stamp sets through Sweet 'n Sassy Stamps. My first two stamps were released September 1 and I have 2 more being released October 1! 2. My favorite cookie is Oatmeal Raisin cookies. 3. My favorite time of the year is FALL! 4. I love to laugh but often find myself being very serious. 5. I am a push over for my kids. All they have to do is ask twice and I often find myself say yes (unless it is something harmful to them!) My husband is the one who is more strict. 6. I love musicals and movies. 7. I never sit still. Even when I am "sitting" I shake my legs. I have a hard time doing nothing! 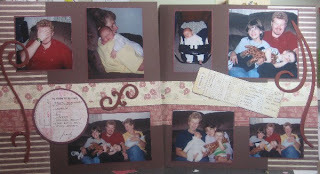 My beginning in Paper Crafting started with Scrapbooking. My pages didn't look like this either. In my 11 years of paper crafting - I have completed 45 Scrapbook Albums. I used to scrapbook ALL of the time - but now I have the addiction of Rubber Stamping too. These are retired papers from Stampin' Up! I painted the chipboard by mixing my own MM paints to get this color - then sanded them a bit to get more of a distressed look. Remember a few weeks ago I promised to post some freezer recipes? Well here is a recipe for you! TACO FILLED PASTA SHELLS makes 2 - 9 in. pans 6 servings each. In a skillet, cook beef until no longer pink; drain. Add taco seasoning; prepare according to package directions. Add cream cheese; cover and simmer for 5-10 minutes or until melted. Transfer to a bowl and chill for an hour. Cook pasta according to package directions; drain. Gently toss with butter. Fill each shell with about 3 T. meat mixture. Please 12 shells in a greased 9 in. square baking dish. (Sometimes, I freeze them on a cookie sheet in individual servings – and then transfer frozen shells into a gallon size freezer bag. Cover and freeze for up to 3 months. To prepare remaining shells, spoon salsa into a greased 9 in baking dish. Top with stuffed shells and taco sauce. Cover and bake for 30 minutes at 350. Uncover, sprinkle with cheeses and chips. Bake 15 minutes longer or until heated through. Serve with sour cream and onions. To use Frozen shells: Thaw in the refrigerator for 24 hours (shells will be partially frozen.) Remove from dish. Add salsa to dish; top with shells and taco sauce. Cover and bake at 350 for 40 minutes. Uncover; continue as above. 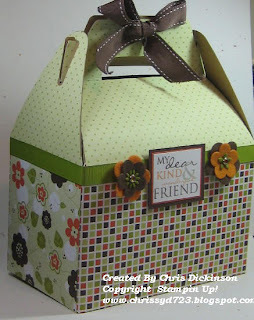 Here is what you need to do...Make a completed project embellishing your work with ANY SQUARE. Share the link here in the comments linking to my Blog and CBC34. When you post to Splitcoaststampers or to your Blog, be sure and put CBC34 as the KEYWORD and mention of the challenge - with a link! I will do a random drawing for all participants and have a special pack of assorted Designer Papers for the winner! The winner of last weeks Challenge was LORI BARNETT- check out her BEWITCHING project here. Lori, please contact me at adickinson@wi.rr.com and I will mail you your pack of DP. Thank you for participating! Well, I looked at the Splitcoast Stampers Sketch Challenge and decided to combine these challenges because I could utilize the sketch for SQUARES! 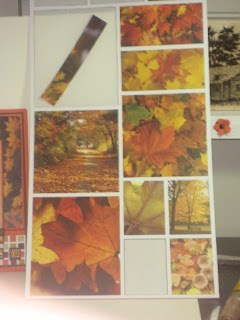 :) Inside my scrapbooking stash was wome REAL LIFE Snapshots with a FALL theme and I originally TRIED to make them work with my Autumn Blessings stamp set...but it was JUST too busy for the simple beauty of those stickers! It just did not match. 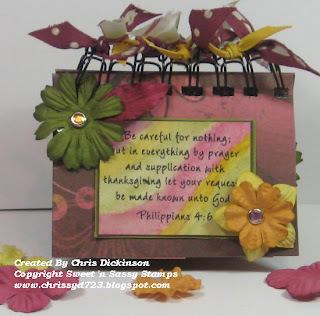 So I set the background aside for that...I had already stamped the Autumn leaves and used the Scripture of All I have Seen... so I needed to revamp and simplify. That is why I have TWO CARDS! I included a photograph of my sticker sheet from Pebbles Inc. Real Life Snap Shot sticker sheet. I used the remaining card to make another - I had all the pieces, so why not? Cardstock: Same as above no vanilla though! Please keep our friend Courtney in your prayers. She is away from her husband and home due to Hurricane Ike. There has been (unknown how much yet!) damage to her home and she is away from her husband. Thank you for stopping by. Be sure to scroll up too for some BLOG CANDY! Courtney has challenges each Tuesday and this week's challenge is to use PUNCHES! Check out her blog - but be warned - she has been displaced by Hurricane Ike and may not have posted it on her blog yet. She had to evacuate and did not grab any stamp supplies in the process! Please keep her and her family in your prayers! I know her Design Team has some posts Dani, Lorie, Sarah and Sparkle. First of all...for all of you parents who have taken a teenager driving for the first time...I feel your pain. I made it only 5 blocks and had to end it. My husband will have to take my dear teenager driving. I fear I would scare her to death with my screaming. LOL All serious-ness...I was curled up with my knees to my chest screaming MOVE OVER!!!!! There was City Bus coming towards us and she was mere inches away from the parked cars that lined the street. OY. It wasn't even the bus I was worried about but the parked car that was perilously close to my new van. Her daddy is now in charge of driving. He is MUCH more calmer than I am. I can now say... I TRIED. 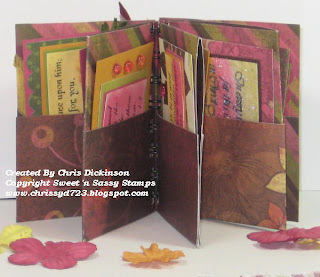 Anyways, today is ROUND UP DAY on the Sweet 'n Sassy Stamps blog! 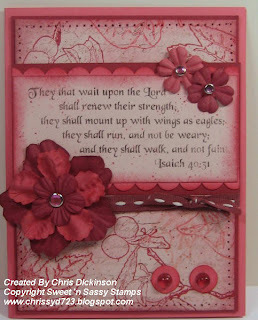 Be sure and check out everyones FABULOUS creations using current Sweet 'n Sassy Stamps! There is nothing better than the Word of God to encourage a friend! 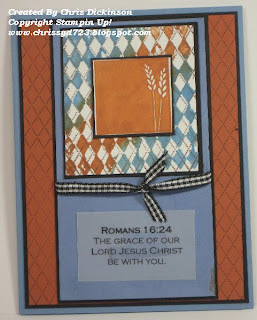 I made this Scripture Binder with my Bind it All and a 12 x 12 piece of Designer Paper from Urban Cosmos. 1. Score your 12x12 paper at 2”, 6”, and 10” one way, and 3”, 6” and 9” the other way. 2. Add Sticky Strip to the 2” edges without removing the backing. This will be between the pockets. 3. Fold the 2” edges to the inside. 4. Fold UP the fold at the center between your 2” folds. 5. Cut along center line to the last of the 3” score lines. 6. Accordion fold the paper on the side that has not been folded yet. Where the 2” flaps have been folded in should be the inside fold on the top and bottom of the paper. 7. Spread the paper apart along the cut line. Fold over at the cut line to make long strand of accordion folded paper. 8. Adhere bottom and side of paper on the section that folded over to make the long strip. 9. Use Bind-It-All to bind your book. 10. Make the tags for inside your book. 11. This book also holds gift cards or money if desired. I will take pictures of each step tomorrow and include those here. I have a class this evening and can not do it at this time. Thank you for looking! If you have any questions, just ask! Have a great day! 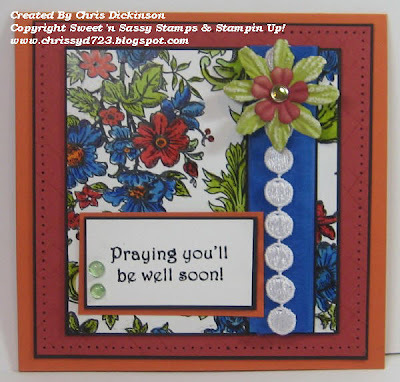 I originally made this card for a swap when these stamp sets first came out. Both Good Things Grow and Looks Like Spring are retired form SU now. My love for these sets has not changed, so I kept them in my stash! The text I used with a piece of Vellum Cardstock and my computer-printer. I love the argyle on this card, it makes a beautiful masculine cards. One of our friends loved this card so much, they ordered some of them, so I made 20 of these just to have on hand. Remember the chalk pastels that SU carried a few years ago? I used the small triangular pads and inked up the stamp using the Rust color first then the Blue. Thank you for looking! I hope you have a blessed day! 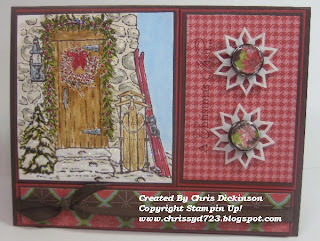 This stamp set, Christmas Pointsettia is my own design! 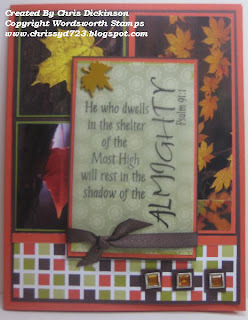 It will be Released OCTOBER 1 at Sweet 'n Sassy Stamps. I used the Core'dinations cardstock for this card too. I have two more stamp sets being released on October 1. If you have not seen the other two that were released on September 1, they are called Child of God and Autumn Blessings. Be sure to check them out at Sweet 'n Sassy Stamps! This is the sketch at the OCC - check out their artwork. It is FABULOUS! 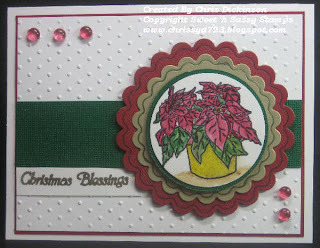 Stamp Set: Christmas Pointsettias - designed by me! 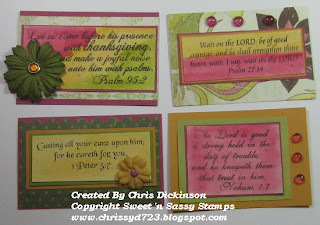 :) available Sweet 'n Sassy Stamps after October 1. I am going to tweak this tomorrow - so be on the look out for a new look! Hope you have a great day! Thank you for looking! These are notes compiled from the class I took and other research I have done. - Compatible dye ink choices, Adirondack or Marvy Matchables. You can use Brilliance pads but these will need to be heat set. - May use brilliance pigment ink without embossing on regular cardstock - not coated paper. - Best suited to Matte coated paper for beginners. 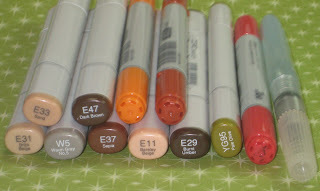 WHAT MAKES ALCOHOL MARKERS SUPERIOR TO WATER BASED MARKERS? - They will not cause the paper to "pill" when layering or blending. - The alcohol base allows you to use them on multiple other surfaces not suited to water based mediums like - plastic, glass, wood, shrink plastic, fabric, terro cotta, wood and vellum. - Color is extremely vibrant and intense. The second number in the combination here is 0. 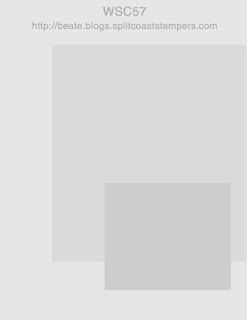 There is a GREY SCALE that ranges from 0-9 that will show the intensity from light to dark. This will represent the value or shade within the color . This last number represents the intensity or brightness of the color, with 0 being the lightest and 9 being the darkest. So R01 is the same shade or value as R09, but a MUCH lighter color. When selecting colors to use for shading, if the alpha/ number in the first two column are exactly the same, make sure there is a difference of 2 or more in the number of the last column. For example, shade R01 with R03 or greater. 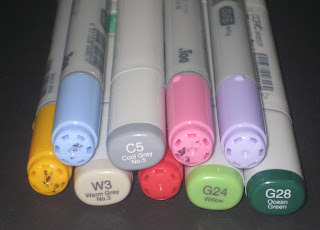 If you shade with a marker 1 number up, such as R02, the difference in colors is so slight that your untrained eye probably will not even detect it. Keep that in mind when selecting colors to purchase! Grays are divided into 4 catergories - C for Cool Grays, W for Warm grays, N neutral grays and T is for Toner grays. - Keep caps on markers when not in use. Alcohol markers dry out quickly if left uncapped. - Markers can be stored upright or flat, it doesn't matter. - Use care when replacing caps on Caio style markers - if you hit the cap at an incorrect angle with the brush tip of the marker, you can damage or destroy your tip. - A refill bottle of ink will fill a Sketch marker 10-12 times. -Regardless of what paper and ink you use, always make sure your image is completely dry! Never just stamp image and begin coloring. - Can shade by coloring over with a lighter color with a darker color, then use color less blender in small circular motions over the line between the two colors to blend them together. - Ink sinks into paper quickly - can't move the color around with blender pen. Do NOT use Blender pen, this will just make a splotchy mess on your work. - To minimize brushstroke marks while coloring image, color selected area of image in moving in long strokes from top to bottom across from one side of the area to the other without lifting marker until entire section is done. Go back over any "missed" white spots along edges. - Use chalks with small applicators to shade areas. Can use with white eraser to remove chalk from areas or clean up edges if you chalked outside the lines. If you have any questions, please do not hesitate to contact me. PLEASE let me know if this is helpful! Hello Everyone, this project is pretty simple! I have had a week of Character Building Opportunities and have fought an intense battle! So today, I feel weary - physically and emotionally exhausted and I am needing some restoration time with my family. 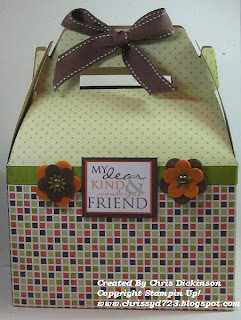 I made this box for my special friend Roseanne and I am filling it with a bunch of stamping goodies! I was supposed to go over there this evening, but with my Family Adventures I am having to stay home BUT will still be making this delivery for her. :) I hope she likes it. On Tuesdays, my friend Courtney hosts Challenges and I am late in participating...because of our adventures. This weeks challenge was to make or alter a box. I originally was going to do the pencil box along with a tutorial, but life got the better of me, so I decided to just alter this one. :) This is one of the Gable Boxes I ordered from U-line. Check out all of the great ideas Courtney's Design team made! They are all fabulous! The Bloggers Challenge is to use your Designer Specialty Papers. Be sure to check out everyone's wonderful projects. You can click on the right side bar BLOGGERS CHALLENGE to see the participants designs with Designer Paper. Thank you for stopping by! I hope you have a great day! Do not forget to check out everyone's FABULOUS designs! This Weeks Belli Challenge is FIBERS!! You can embellish anything with any of your FIBERS . I purchased these Fibers becuase I KNEW I NEEDED them and they have literally SAT around doing NOTHING for years!!!! Here is what you need to do...Make a completed project embellishing your work with ANY FIBERS. Share the link here in the comments linking to my Blog and CBC33. When you post to Splitcoaststampers or to your Blog, be sure and put CBC33 as the KEYWORD and mention of the challenge - with a link! I will do a random drawing for all participants and have a special pack of assorted Designer Papers for the winner! 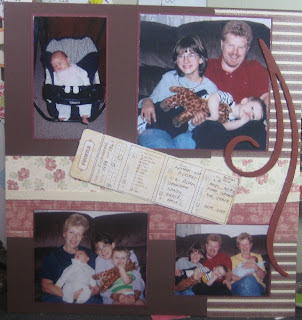 The winner of last weeks Challenge was PAMMY JO - check out her SUPER CUTE project here. Pammy Jo, please contact me at adickinson@wi.rr.com and I will mail you your pack of DP. Thank you for participating! 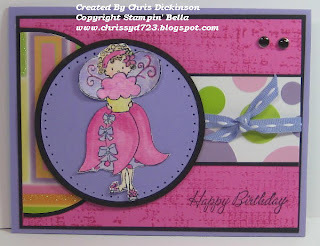 Stamp Set, colors, embellishments and I used different DP in the half circle and layer that goes across. Have a great night! Thank you for stopping by to take a peek...Guess what? By the end of the week, I may have some SNEAK PEEKS for you on my upcoming stamp sets that will be released October 1! :) WOOHOO. Next to my desk there is always Lemon heads or Lemon drops - that keeps me away from some kind of junk food...not that that isn't junk food. LOL But it is a low calorie, give my mouth something to do kind of thing. If you participate in Courtney's Challenge she will have a prize for you! Check out her blog for more details! 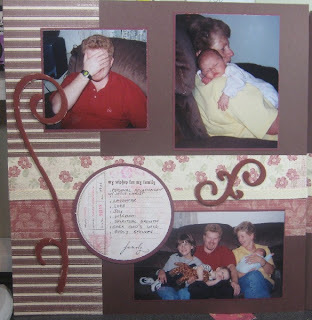 Here is another project using the Hugs for Janessa set. For every purchase of this stamp set - $5- goes to Korin's neice who is undergoing treatment for Leukemia. Once Janessa is in remission, any further proceeds will go to another family going through the same treatment. The sketch is also a challenge from Taylored Expressions! You can view the sketch below. Ohhh I almost forgot! I participated in the Kwerners Color Challenge too! Phew! That is a lot of challenges! Hello! I recently joined the Sisterhood of the Blogging Stampers 24 and need to introduce myself to my group. For those of you who already know me, this may be a bit redundant or maybe it will be something new. I am a stay-at home mom, who Home schools her children. Stamping and scrapbooking are my second passion. I just started Designing stamps for Sweet 'n Sassy Stamps too. My first 2 stamp sets were released September 1! I have been happily married to a wonderful man named Adam for 14 years. Well, let's be honest... I had about 3 stinker years in there, but we worked through those and are committed to working through the remaining years the Lord has us here on Earth together. I am actively involved at my church - and over-see the Card Ministry Team at our church. My faith in Jesus Christ is the foundation of my life and everything I do. I would be happy to share more with anyone who wants to know more! One last cool thing....do you know what is REALLY cool - Sisterhood friends? Anna Banana in our very own Sisterhood Group - through some chatting and sending e-mails back and forth, lives in the same town as I do and we had never met before! *WOW* How cool is that!? I look forward to getting to know you better - sharing creations, encouraging you in your work and life and recieving whatever you have too! The Bloggers Challenge this week was to use Riding Hood Red, Pacific Point, Kiwi Kiss and Tangerine Tango. Honestly, I was thinking that is a WHOLE LOTTA color to work with! LOL So intially I was thinking what can I water color? But you know what? truthfully, watercoloring is EASY for me, so that would not have been much of a challenge besides the color combo... So I looked over my stamps and grabbed Bella Toile, then my Copics. I only have a handful of Copics, so the great thing I LOVE about them is blending them to make the colors work for me...I used what I had! Some of them I just colored the lighter color first then went over it with the darker color. The background on the Riding Hood Red is the Distressed Background and the words are a stamp set from Sweet 'n Sassy Stamps. 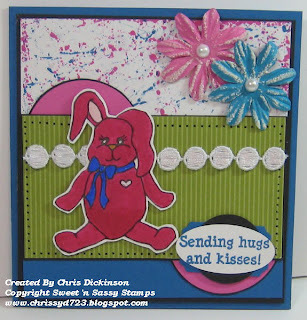 Hugs for Janessa is the title for the stamp set - here is a bit more information about that! This set was created in honor of Korin's sweet little neice Janessa. She was born with Down Syndrome and later diagnosed with leukemia. She is currently going through chemo treatments and it has put great strain on her family and their finances, so $5 from each set sold will be donated to Janessa's family. When her cancer is in remission, the fund will go to another family suffering through the same thing. Click here to see the entire stamp set! Whew! That was a lot to say. :) Thank you so much for stopping by and commenting! Have a fabulous weekend!!! Our Care Ministry, which we call the Hands & Feet Team have a theme this year. It is all about GATES. Letting go of the past and Entering into the new...Each one of us, is on our own journey of growth and the Lord is leading us. If you do any word studies in God's Word, the number 8 signifies a new beginning or ending of something...And guess what? Our year is 2008! A year of NEW BEGINNINGS - stepping into the NEW seasons of life! Now, that brings me to this stamp set. Back in July, I saw this stamp set at Our Daily Bread Designs (Path of Life) and KNEW I had to have it. I am going to make each person in the Hands & Feet Team something with this stamp set, as a remembrance of our year of growth together. I loved the imagery of the open gate - to me that signifies an invitation from the Lord. "Come in and grow with me." Do you hear Him calling? I put a few close ups of the watercolored image and the Build a Brad. 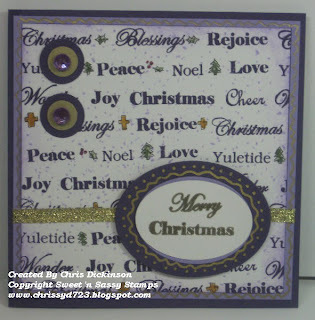 I stamped Lovely as a Tree (the small leaf) in Handsome Hunter and used the half inch circle punch. I watercolored Night of Navy for the surrounding area. Well, (a deep subject - lol) thank you for looking. May your day be filled with many blessings! In case I have not told you lately, I love your comments - good or bad! They help me grow and stretch to more work and improve too! BELLI CHALLENGE #32 - BACK TO SCHOOL! This Weeks Belli Challenge is BACK TO SCHOOL!! You can embellish anything with any of your BACK TO SCHOOL things. I thought I had a school themed stamp set laying around that I would use, but I was mistaken! I must have sold it! So I dug deep down in my "stuff" box and grabbed these felt letters that have been laying there for 6 months. I used them on another Belli Challenge, remember? Here is what you need to do...Make a completed project embellishing your work with ANY BACK TO SCHOOL THEME. Share the link here in the comments linking to my Blog and CBC32. When you post to Splitcoaststampers or to your Blog, be sure and put CBC32 as the KEYWORD and mention of the challenge - with a link! I will do a random drawing for all participants and have a special pack of assorted Designer Papers for the winner! I am hoping my request to join this group is approved! This is the latest Sisterhood group that is meant to share ideas on stamping, scrapping and everything else that we create and choose to share! To my upcoming sisters (*I hope*), I look forward to getting to know you, gaining inspiration and new relationships with you! You can see my Art style but looking through my gallery and more about me through my profile. I look forward to being "official" as Tracy says, and getting to know you! Thank you for the chance to be part of the Sisterhood! If you missed the Sweet 'n Sassy release party on the new forum you should still check out the three challenges with prizes. You have until Sept. 7th to make and upload your card. Here's my card for Faith's Color Challenge. The challenge is to use the Orange, Black and White...but I see I failed! I used vanilla instead! OOPS! You have until September 7th to participate in the challenge and have an opportunity to win a FREE stamp set! For more details, check out Sweet 'n Sassy's Blog. I started to make this Friday night, during the release party but had a very hard time focusing on stamping AND chatting. LOL I started by stamping the leaf in brown to give it a softer look. Then watercolored the leaf with tangerine Tango, More Mustard and Real Rust. After that, I embossed the words in Black. It just didn't look right to me and with everything going on, I set it aside until TODAY! So today, when I looked at it - it screamed BLAH! In order to jazz it up a bit, I used the black marker and traced the outer portion of the leaf and a few of the veins...did some paper piecing and used Daisy D's Gypsy Harvest DP. Love that DP! Have a fabulous night! Be sure to stop by tomorrow for the BELLI CHALLENGE! I am back from being out of town again for a few days. Every time I go, I feel like as nice as it is, it takes a few days for me to catch up on sleep and the fuzziness of the cob webs from relaxing to clear out. 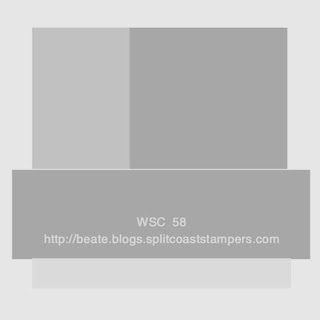 Today on Splitcoast Stampers is the COLOR CHALLENGE! We had the chance to make any color combination as long as it was MONOCHROMATIC. The colors I chose are Riding Hood Red, Blush Blossom, and Cameo Coral. I made this card for my friend Jana. Her father is very ill and the prognosis does not look good. She is the type of person who will not talk about things and keep it to herself, so I know a kind word, Scripture and lots of prayers will do a lot to encourage her.